You can stand up in the van any time – no need to pop the top first. High tops can be insulated. Stealth camping can be a bit easier. While a high top van is perhaps more obviously a camper than a pop top with the top down, there’s no way to disguise a popped top when you’re trying to be subtle. Less noise – poptops are more akin to sleeping in a tent. Convinced? If you are, there’s a few ways to go about installing a high top in your van. If you’re comfortable cutting a hole in the roof of your van, you should be able to install a high top yourself. First step, though, is finding a suitable top. As with anything used, check craigslist, local wrecker’s yards, and van-specific forums. I’ve seen the most success with wrecker’s yards / pick-your-part locations. Apparently there are often commercial vehicles in there, such as shuttle buses, with high tops in good condition. 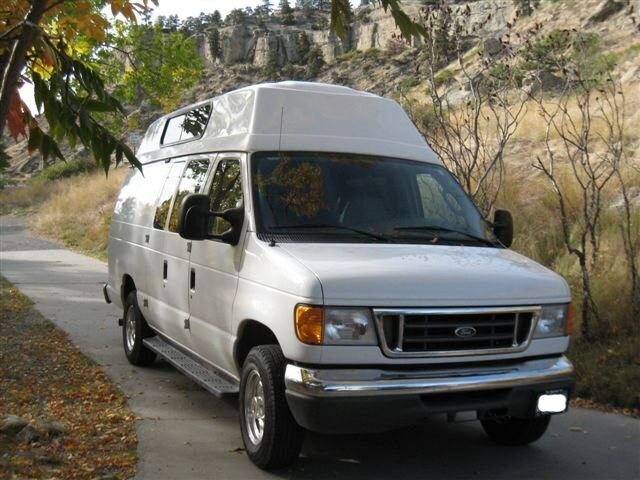 discountvantruck.com – a wide range of different styles, from tv tops to the 24″ bubble top popular on conversion vans. Prices are good: about $1200 to $1500. They also sell liners, windows, insulation, and installation kits to make life a bit easier. Fiberine.com – plenty of different styles, with the highest at 34″. Millenium Products seems to have gone out of business, as of 03/2010. I’ll update this if I learn otherwise. I’m going to point you to a few online resources here, since I’ve never installed a high top myself. The links below provide excellent information, and lots of pictures, to get you going with your install. High top installation video from Cyclevan, who are also listed in the Installers section below. If cutting a hole in the roof of your van and attaching a top without leaks makes you nervous, there are a number of places that will do it for you. I can only list a few for you here, but I imagine that every town has an accessible-van installer that can do the job. Sportsmobile: very nice, high quality tops, that can be customized with cabinets, bed platforms, insulation, etc. They’ll also set you up with custom aluminum racks, light bars, and the works, to turn your high top into a mean camping machine. Good reputation. Locations in California, Texas, and Indiana. Cyclevan: I don’t know anything about Cyclevan, other than their videos on youtube. They seem to install high tops, and do other conversion work. Located in New Jersey. Awesome! Check out any of the companies on this page or on the Poptops page (poptop installers will often do hightops as well). Good luck!